The public’s anti-incumbent mood is at record levels, but the vast majority of senators and representatives running for re-election appear to have little to worry about. What’s up with that? That would seem to be at odds with recent survey results. A Washington Post/ABC News poll released this week, for instance, found that only 22% of the public said they were inclined to re-elect their representative in Congress. The all-time low (since 1990) was 17% in August 2011, just after that year’s debt-ceiling showdown. In the latest poll, two-thirds (68%) of people said they were “inclined to look around for someone else to vote for,” also a high for the Post/ABC poll. 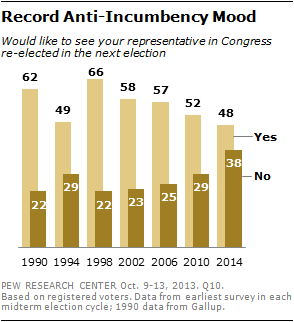 Last fall, a Pew Research Center survey also found record anti-incumbent sentiment, though it went about measuring it somewhat differently. We asked registered voters whether or not they’d like to see their representative re-elected in the next election. Fully 38% said no, the highest level for that response in the two decades we have been asking that question. Similarly, only 46% of registered voters in a January Gallup poll said their representative deserved re-election, compared with 17% who said “most members of Congress” deserved re-election. Both figures were record lows. Of course, it’s one thing to say your representative doesn’t deserve to be re-elected, or even that you’re open to voting him or her out, and actually doing so. Historically, Americans have been more favorably disposed toward their own representatives than to Congress as a whole (a phenomenon dubbed “Fenno’s Paradox,” after eminent political scientist Richard Fenno). 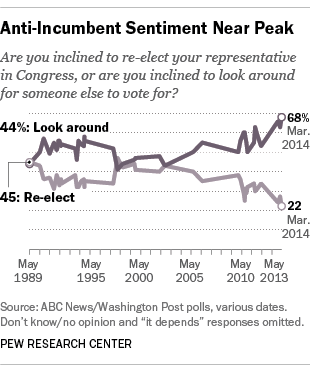 That disjuncture that has been reflected in typically high re-election rates. On average, in each of the seven House elections between 1978 and 1990 (inclusive), fewer than 20 representatives were defeated for re-election. It’s also worth noting that opinion surveys on incumbent sentiment haven’t always been the best predictors of big electoral swings. In fact, two of the biggest anti-incumbent waves in recent history weren’t preceded by surges in anti-incumbent sentiment. In August 1992, only about half (48%) of registered voters in the Post/ABC poll said they were looking around for another candidate. 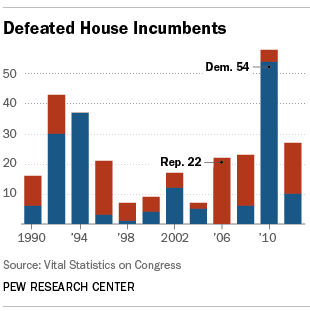 That November, 43 incumbents were defeated, the most in nearly two decades. And just ahead of the 2010 elections, which unseated 58 representatives (54 of them Democrats, which President Obama called a “shellacking”), 55% of voters told Pew Research surveyers they wanted their representative to keep his or her job.